Historical Markers and the nerdyness it takes to pull over for one. You have to be a special kind of person to pull over on the side of a road to read about some obscure factoid that’s relevant to the exact spot (possibly) where it was placed. Typically on a giant metal plate or stone monument, often with fading painted letters or a worn down surface. All while most likely traveling to get to a vacation destination, which is probably not close to the spot you just pulled over at. If that paragraph describes you, or maybe how your father took road trips across America, then welcome to the club. Unless I’m pressed to make it somewhere for a hotel reservation, or we need to eat, if I haven’t pulled over in the last hour and see that wonderful brown sign “Historical Marker 1 Mile”, we’re about ready to pull onto the shoulder of the road and read about some folks history forgot! This historical marker could probably have just been put on the side of the US Route 377, but the State of Texas put it on the actual site of the event. Which was great for me because it helped me find a couple of interesting places to photograph. Thanks to the placement of the San Saba historical marker, I came across this long abandoned school. While I make jokes about the seemingly randomness and sometimes vanity historical markers towns get erected; when the town is basically the surname of the founder followed by the word “burg” or “ville” and every car dealership, drugstore, and law office in town still have that surname. Well it’s not hard to figure out the descendants of John Weasel, probably helped get a historical marker from the state telling people who founded the town and how it got the name Weaselburg. As if no one could have figured that out. However, occasionally I’m truly surprised and you do learn about the history of the country. In Missouri, not far from the confluence of the Mississippi & Ohio Rivers is a spot marking the site of the Sharecroppers Strike of 1939. There is a plaque and monument which tell briefly of what happened, but thanks to mobile phones and the internet I was able to pull up a wonderful retelling of the story along with images from The Library of Congress right on the spot along U.S. Route 62 where it happened. Even foreign visitors love a good historical marker. This woman from New Zealand pulled over on part of her American road trip to read about the strike. While in Texas last month I pulled over for one of what I’m sure are several markers along the Western Trail. One of the last old time cattle trails that started in Texas and went as far north & west as Montana. It too became a piece of Lost Americana as farmers fenced off their lands and the trail became interrupted. Sadly not only are the days of the cattle trail gone, but as you can see from the picture below, mother nature isn’t the only enemy to these markers have, vandals most likely at some point knocked this one over as it is broken and re-cemented at the base. My oldest son taking a moment to stretch his legs read up on the Western Cattle Trail. 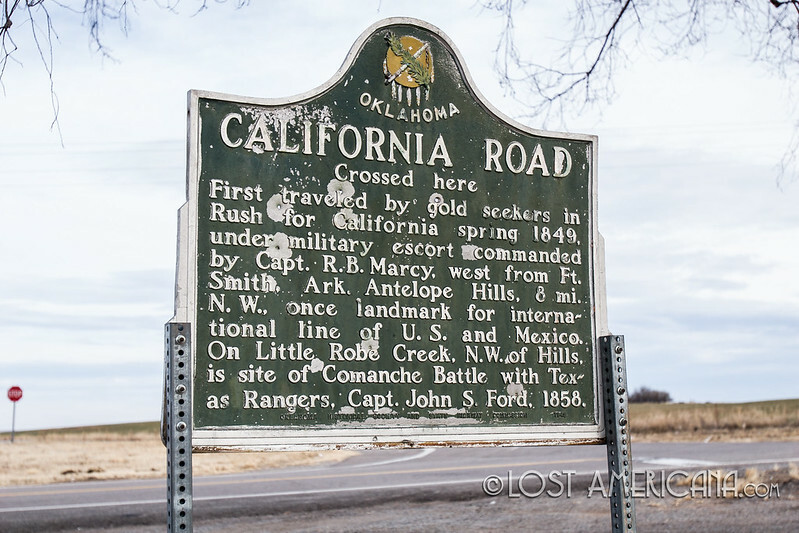 While I always suggest just finding historical markers along your next trip, you can always search out the more interesting ones, or even plan a trip around a point of history. Here are some websites to help you navigate historical markers. Beyond just historical markers, Read the Plaque looks at all kinds of monuments no matter how big or small through the world. Started by the people who do the 99% Invisible podcast, it is worth a look for an more artful & curated take on plaques of all kinds. Melinda Roberts, runs this website taking a look at the Badger State’s historical markers. While not as extensive, this is maybe a little more curated, you can check out an album of historical markers on the Lost Americana Flickr page. ← What Happened To Lost Americana in 2018?